Equipped with a 42 in. reinforced steel cutting deck, powerful Briggs & Stratton 15.5 HP engine with automatic hydrostatic transmission that doesn't require stopping to change speed or direction, the Poulan PRO PP155H42 riding.. Equipped with a 42 in. 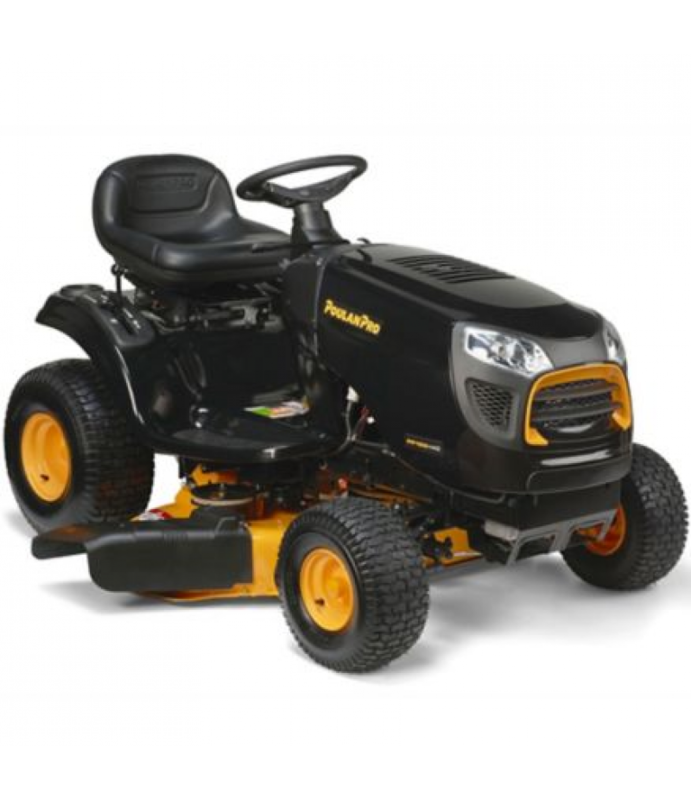 reinforced steel cutting deck, powerful Briggs & Stratton 15.5 HP engine with automatic hydrostatic transmission that doesn't require stopping to change speed or direction, the Poulan PRO PP155H42 riding mower packs a lot of punch for its size. The 13-gauge reinforced steel deck and cast iron front axle provide exceptional durability, excellent stability and long life. It's ideal for yards with flat, hilly or uneven terrain and, with a spring-assisted deck lift with 6 cutting height positions, it's easy to choose your favorite grass height or adjust to the best height for the current condition of your lawn. A very tight 6 in. turning radius is perfect for maneuvering around challenging terrain and obstacles like trees, shrubs and flower beds and the mow-in-reverse feature keeps blades engaged for continuous mowing while shifting between forward and reverse directions. Anti-scalp deck wheels reduce the risk of scalping your lawn when mowing uneven terrain and large 20 in. rear tires with Turf Saver tread provide excellent traction and a comfortable ride, without harming your lawn. Other convenient features include headlights and built-in cup holder.